HL23 is a 14-story residential condominium building at 517 West 23rd Street in Chelsea that was developed by Alf Naman and has been designed by Neil Denari. 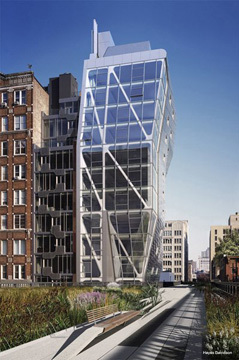 It is one of the more dramatic buildings rising around the High Line Elevated Park. The building is just to the east of the narrow High Line 519 residential condominium building that was designed by Lindy Roy and features cloud-shaped scrims on its balconies. Mr. Naman is the developer also of 100 Eleventh Avenue, which is now in construction and has been designed with a curved facade of differently sized and angled windows by Jean Nouvel across 19th Street from the sail shapes of the recently completed IAC office building designed by Frank O. Gehry. The Denari design rises from a very narrow base and cantilevers out over the High Line and has diagonal columns and stainless steel panels with some soft, almost folded, curves on its facade. The building has two duplexes on its bottom and top floors and 9 floor-through apartments ranging in size from about 1,900 square feet to 2,600 square feet. The penthouse unit has 3,700 square feet and a terrace. Apartments are initially priced from about $2.65 million to $10.5 million. Living rooms face south and bedrooms and master baths will face north and the north and south facades have motorized window shades. Mr. Denari is based in Los Angeles and was the director of the Southern California Institute of Architecture. He was the author of "Gyroscopic Horizons," which was the best-selling book in 1999 for the Princeton Architectural Press. In a September 19, 2007 interview with Orhan Ayyuce at archinect.com, Mr. Denari commented on "deformation" and his interest in "folds." "...de-forming means to make something incorrect for the normative world....My stuff is aggressive but not in a polarizing way. It does things without shouting, but when you kind of look at it you realize something is going on spatially, appearing as something new or uncertain. One client calls it as walking around being drunk." Marc Rosenbaum is a collaborating architect for the project and Gruzen Samton Architects are consulting architects. The initial renderings indicated that the building would be all all glass and stainless steel but when the building was completed much of its east facade overlooking the High Line was plain white. The angularity of the design, nonetheless, is interesting and quite dramatic especially on 23rd Street where it looks like the buiilding has really sucked in its tummy at street level. 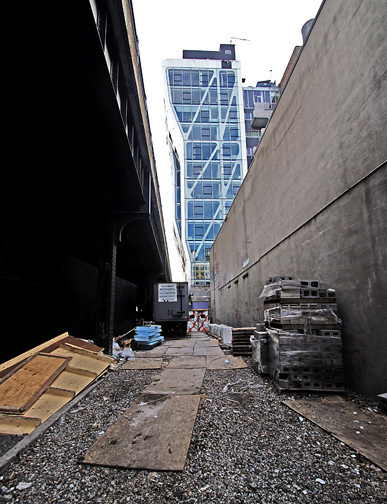 "Known as HL23, for its site where 23rd Street meets the High Line elevated park, the 14-story tower is among the most ambitious of the many buildings spawned by the opening of the wildly popular park in 2009. And in a reversal of the architectural setbacks for which New York has long been famous, HL23 doesn't get narrower as it goes up; it rises from a small footprint in the shadow of the High Line and grows opportunistically wider, so that portions of its upper half lean out over the park itself. "Los Angeles architect Neil Denari's new residential tower on the West Side of Manhattan is a standout building in ways that begin with - but aren't limited to - its gymnastic form. "But the most surprising thing about the building is how it turns on its ear one of the most stubborn assumptions about the differences between architecture in New York and in Los Angeles. It used to be that for young, experimental or otherwise untested architects, L.A. was the place to get an unorthodox design built. In New York, on the other hand, opportunities for those architects tended to be limited to residential or commercial interiors that had no impact on the skyline. "HL23, which holds 10 floor-through apartments plus a two-story penthouse, is a sign of how dramatically that equation has changed in recent years. In Los Angeles, Denari, long one of the city's most prominent architects and from 1997 to 2002 the director of the Southern California Institute of Architects, has only interior projects and residential additions to his name. (His best-known designs are the headquarters of the Endeavor talent agency and a Beverly Boulevard branch of L.A. Eyeworks.) To complete the first ground-up building of his career, the 53-year-old Denari had to go to New York - to Manhattan, more surprising still, the island that was for decades known among architects as the place visionary dreams went to die."